This little gem of a treat, The Cranberry Bliss Bar, is one of my favorites during the Christmas season. Starbucks holds it from us year round and only offers it for a few weeks and that only helps grow the excitement. 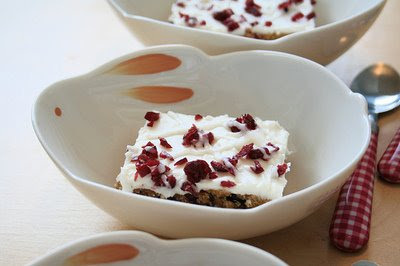 I'm not a fan of sweets....would much rather have a salty snack over a dessert....but this cranberry bar is so very good. And, so very full of 17 grams of fat! Just learned that. Will be cutting back. Otherwise, I will gain back all of the weight I have lost since Blake ventured to KC! For those daring enough to try, the supposed recipe can be found here. If you make it, do NOT send any my way. I have no will power. Just tried this for the first time this week. Thank goodness they don't have in year round. I would be large and in charge!